A marketing campaign is unlikely to be successful if the outreach is limited. If you stuff your promo message in a bottle and throw it into the ocean waiting for someone to find it, you might be waiting a long time and there's a good chance that it will never be seen. The message you want to send out to the marketplace needs to be one that will be seen by the largest possible audience. Also the message has to have impact to be effective. You can buy advertising if you've got the budget, but in many cases that budget will be small. To get the most mileage for your marketing dollar be sure to have a decent press kit or at least send out press releases to the sources you think might be most apt to use them. Make contact with people you know to see if they can help. If your sister has a friend who has a cousin who has an in-law in the radio business see if you can snag a radio interview. In other words enlist the aid of those who could possibly be of any help to you. Be willing to try innovative experiments to deliver your message, but be sensible as well. Most people will never hear of you or your product if you don't take action to get the word out to them. A message in a bottle might not be a good marketing tactic, but it makes for a nice romantic story. It is also is the basis of the classic song written by Sting. This Battle of the Bands pits two different versions of "Message in a Bottle" in contest to decide on the readers' favorite. 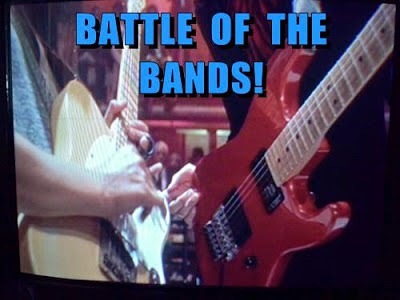 This is another edition of the twice monthly feature The Battle of the Bands. First conceived by Faraway Eyes at Far Away Series and joined by Stephen T. McCarthy at Ferret-Faced Fascist Friends, I've been also joining in the Battles on the 1st and 15th of each month to add my own twists on the musical mix. Others join in now and then--you will find some of those blogs at the end of this post--and you are welcome to stage your own Battle as well--just let us know in the comments so we'll come visit your contest. This song first appeared on Reggatta de Blanc, the second album by the Police. Sting has been quoted as saying that this is his favorite Police song. Next a more mellow take by singer/guitarist John Mayer. What are some of the ways that you've delivered marketing messages? Have you ever helped someone else spread the word about their product or cause? Do you still read newspapers? Have You Read Any of These Books Born from #blogging #atozchallenge ? Five Ways to Market Your Band For FREE! I'm hoping the publicity about my book pays off, don't think I will resort to the message in a bottle yet. I vote for the Police version of the song. One I remember very well. Mayer's is good, but he really slowed down the tempo. Like the Police's version better. Even though I don't like the song, I'll vote for the Police. I didn't care for their first 2 albums at all....I preferred Zenyatta Mondatta. And no, I don't read the paper anymore...not when so much is available online. The Police get my vote. I still read the newspaper; can't seem to break the newspaper-with-my-morning-coffee routine. This one is hard for me, Lee. I like the Mayer version and I know I would prefer it to add to my mellow playlist. In fact, I suspect that the more I listened to it, the more I'd like it. I really like acoustic versions of songs. It feels more intimate to me. Like it is just me and the singer and he/she is playing their song on the guitar directly for me. So, I am going to go with my gut and say that with protracted listening I would like the Mayer version better and vote for him. Never one of my favorite songs...hate to say it! But I tend toward Mayer. Yvonne -- I think you're off to a good start with promotion. Alex -- Mayer is really laid back. JoJo-- I don't even read much online. I am often uninformed. Dawn -- I've been reading the paper, but they are papers that are a couple years old. Robin -- Finally a vote for Mayer. I get what you're saying. Carol -- Now the Mayer votes are starting to wash ashore. Hey now, messages in bottles are found... like 100 years later! LOL! Someone call the POLICE... still the best. I was out for a virtual walk today, so I thought let's visit the great A to Z team! The Police version and I never read the newspaper. I just don't have the patience for it. Going with Police version. Maybe I just needed something peppier this morning. My bottle's still out there somewhere. Big note inside. The Police get my vote, hands down. I like John Mayer, but it doesn't have the energy of the other version. Big fan of Sting, too. Now to check more BOTBs. Good choices, Lee. The Police win this one for me. Mayer's version was too mellow, I was getting bored. Message in a Bottle sounds nice but it's not so much for advertising than the mystery of when the letter will reach the receiver. While I own both versions, there have just been too many years of listening to the Police version for Mayer to win. to note that you are back again! Patricia --- I read about the recent story. Jeremy -- Good to see you out and about. Lee -- I've lost patience with the newspapers I've read in the past few years. I used to love to read the paper. C.Lee -- I hope that someone gets your message in a bottle. DG -- I like Sting too. Sheena-kay -- And when it's about promoting something we don't need the mystery of when the intended audience will get the message. Chrys -- John Mayer is not faring well so far. Larry -- Of course he's whiny! You'd be whiny too if you were stranded on a desert island waiting for someone to get your message in a bottle. PV -- Even a metaphorical message in a bottle is not a good idea for marketing. I've never been a real big fan of The Police and I really didn't like this song. I know this sounds silly, but it always seems very repetitious. So, I thought I would like the Mayer version better. I mean, acoustic guitar and all that jazz. BUT, give my vote to The Police, please. While I do like some of JM's stuff, here he sounds whiny and at the end there, it really sounds like he's in pain. I'll be right upfront with you and admit that I have pretty much ZERO TOLERANCE for Sting. I absolutely cannot STAND that phony Jamaican accent he tries to sing with. I mean, it would be bad enough just some very White English bloke putting on a Jamaican accent, but Sting doesn't even do it well at all! I guess he thought trying to be 'Rastabloke' would make him seem more cool to people, but I just thought it was so artificial, and I was just NEVER buying into his 'Rastahonky' persona. I don't know if anybody other than John Mayer ever covered 'Message In A Bottle', but if so, you could have put just about ANYBODY up against Sting's original and I would have voted for "ANYBODY" without question! Now, the Mayer version, being slower rather than ultra-upbeat is more consistent with the theme of the lyrics. However, Mayer's version seemed a bit flat to me; it definitely could have been filled out a bit more from a musical perspective. Perhaps a mournful harmonica break, or a deep, gravelly tenor sax solo in there somewhere would have added the missing dimension that would have kept the song from seeming a bit too sedate. But nevertheless, although I'm not too excited about Mayer's cover, it trumps Rastabloke's original by a large margin, in my opinion. Nicki-- I had to read that twice. You caught me off guard. Jo -- So I'll make yours a vote for Mayer? Faraway -- But he is in pain from being lonely. StMc-- Seriously, I kid you not, I almost dedicated this pairing to you. Your comment does not surprise me and neither does the vote. But it was a pretty clever tie-in to my marketing topic wasn't it? I'm a child of the 80s, so it's The Police all the way!!! My "message in a bottle" is mailing out bookmarks to libraries and school libraries all over my city...I think a message in a bottle would certainly be cheaper! I never knew Mayer did a cover of Message In a Bottle and it's not half bad. I still have to go with The Police, though. Yes, I have definitely appreciated the creative way you've managed to weave your 'Battle Of The Bands' posts into your 'A To Z' theme and kept 'BOTB' alive. I would have missed ya if you'd dropped out of 'BOTB' during the month of April. In 1979, Sting & the Police would have gotten my vote. Still love them. But now? John Mayer is what I prefer. I can understand and feel the song. Stephanie -- Do you ever deliver the bookmarkers in person and set up author signings or talks? Mark -- Mayer is mellow. Joanne -- There's still hope. You've got the knowledge now you just have to practice. StMc-- Can you imagine how much we'd miss you if you stopped this BOTB thing you've had a big part in starting. I'm loving this, but I'd hate to be doing it alone. Besides you add interesting bits of information to your BOTB posts which makes them extra special. Susan K-- I've been a fan of the Police since they first arrived on the U.S. scene with "Roxanne". Very nice to hear (or... read). I do enjoy 'BOTB' quite a bit, but I have decided that in order for it to warrant my time and effort, I need to receive no less than 10 votes per installment (counting my own vote). For popular bloggers like you and Robin, 10 votes is nuttin'. And in the beginning, I was getting anywhere from 11 to 16. So, anyway, I have made up my mind that I will continue with 'BOTB' until the very next time I fail to receive 9 votes, plus my own. At that point, I will be done with it. But, thanks again for your nice comment, BROTHER BIRD. I hope to continue with 'BOTB' for a long time to come, because I have a list of songs as long as my arm. Surprisingly, I liked John Mayer's laid back version better.